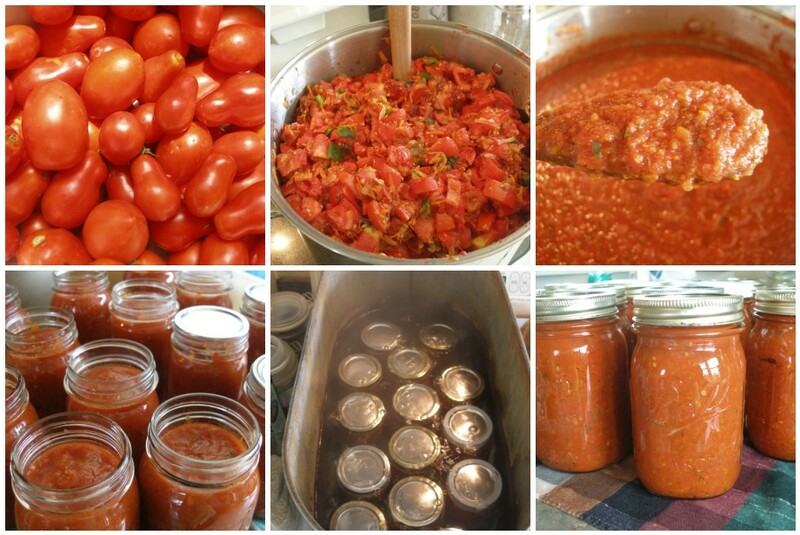 This past weekend I made the first of (hopefully) five batches of our favorite tomato sauce. I can't say enough about this sauce. It's extremely versatile (we eat it over pasta, on pizza, etc.) and is packed full of vegetables that our children can't see (carrots, peppers, onions, garlic). It's also a thick sauce that doesn't require hours of baking or boiling down. Oh. Did I mention that you don't even need to remove the tomato skins? It's true. And you'd never know they're in there. I know. I know. Folks tend to be pretty loyal to their sauce. But! If you're ready to try something a little easier, a little different, packed full of veggie goodness and fresh garden flavor, go on and give it a try. Need some other ideas of what you can do with your tomatoes this year? Let me offer a little help. I have Simply In Season, but I'd never noticed this recipe in there before! My farmboy makes a great barbeque sauce - my garden farmgirl does sundried tomatoes - I make spaghetti/pizza sauce. Wish you could send some of those beautiful tomatoes here- our drought finally got my tomatoes; I miss them something awful. I'm looking forward to checking out your links on what to do with all these tomatoes besides just canning them!!! I should know better than to visit your blog when it's about food and not even lunch time. My mouth is always watering and I'm leaving after bookmarking the post for the best recipes! Just this morning I was thinking of doing a tomato link list! It must be August! You don't have to remove the skins,hey,this recipe is for me. I just don't have a lot of time to do everything. I made stuffed green peppers today. The ones I got from the farmers market.I can't wait until MN corn is ready . There was one lady at the farmers market wanted $7.00 for 1 dozen ears. She must think me stupid! What perfect timing you had with this post. I will be working on my tomatoes this week most likely. And, I needed some salsa, sauce, etc. ideas. Thanks! P.S. - I love that you have a recipe where you don't remove the skins. I almost never remove my skins. This recipe looks great. I have a question though because I am new to canning. I thought I read somewhere that you had to process mixed ingredient sauces, etc according to the lowest acid ingredients. Seeing that this has carrots and onions do you have any concerns over processing time? Or is Simply in Season a trusted book of yours. Sorry to sound skeptical I really want to try this recipe I just want to be as safe as possible. Due to the added non-acidic vegetables, the recipe does call for adding vinegar to each jar just before processing (the amount depends on the size of the jar). Between this and the trustworthy-ness of the cookbook AND the fact that I have canned this recipe for several years now (in large quantities), I can recommend it without fear. Your question is a good one, so don't be sorry for sounding skeptical:-)! I just tried this recipe for the first time. I had seen it on your blog before and had wanted to try it, and today I found myself with just enough romas for a batch. It is delicious. At my house we prefer a slightly smoother sauce, so I did puree it a little in the food processor, but otherwise followed your instructions. Great sauce with less effort and many more veggies. Thanks.